Our superior durability, compression molded, one-piece construction and virtually indestructible EVA/PE foam makes our patented, Wave Skater® Pro boards the perfect choice for retail sales or to build your shop’s, resort’s, water-park’s or surf camp’s rental fleet. When it comes to ultra-durability, virtual indestructibility and superior rider-friendly performance ergonomics in a multi-use water-sports board, our revolutionary Wave Skater® Pro boards are, quite simply, without comparison. Our Wave Skater® Pro boards will take an extraordinary amount of pounding without suffering any ill effects or loss of performance and can be used all year long as bodyboards, surfboards, skimboards, wakeboards, river & lake boards and even as snowboards. They are just that tough and durable! Our revolutionary compression molding process produces a much denser, more heat stable and much stronger molecular bonded, closed-cell foam bodyboard that is impervious to water logging, delamination heat bubbling and heat warping; all of which are common problems for our competitors’ boards. Over the years we have continuously improved our foam formulation, culminating in our most advanced foam yet; a double density EVA/PE semi-rigid foam formulation that flexes when needed and remains rigid when needed, offering riders the best of both worlds. In addition, our molds impart a fully textured imprint to the entire outer surface of our boards, resulting in a “skin” as tough as a “Shark’s.” And this same textured surface, as it appears on the hulls of all of our proprietary foam molded boards, traps thousands of tiny air bubbles, resulting in increased lift and extraordinary speed on the waves. Our patented, dual tapered pontoons, ergonomic hand rails and arm and stomach cavities make turning and maneuvering in virtually any ocean wave condition a breeze, even for the novice, while still giving even very accomplished or even pro caliber riders all the advanced riding possibilities that they desire, whether riding prone, drop-knee or standing up. And you can expect the same high level of performance whether being used as a wakeboard, skimboard, river or lake board, or barreling down a snow covered hill as a snowboard; it just doesn’t matter to our boards, as they will happily accommodate all these various terrains with ease, safety and performance. Our super durable, compression molded, EVA/PE Wave Skater® Pro bodyboards also incorporate molding three high quality fiberglass-composite stringers into the center of our boards, one going down the inner pontoon channel and one, each, going down the center or each pontoon. Once molded and fused into the interior of the board, these three stringers become part of the board itself, giving our Wave Skater® Pro models superior flex, superior rigidity, while at the same time maintaining their vastly superior durability. The two outer stringers are thicker more rigid and shorter than the central stringer, which is thinner, longer and more flexible. Combined, they give the board a unique combination of flex when needed and rigidity when needed as well. Since 2006, we’ve never had even a single board ever returned to us for any manufacturing defect whatsoever and we intend to keep it that way! So if your surf shop, sporting goods store, sporting goods rental business, resort, surf camp or water-park wants the most reliable, proven, safest, most rider-friendly and most durable multi-use, all year long bodyboard, surfboard, wakeboard, skimboard, riverboard, or snowboard out on the market today, look no further than Wave Skater® Pro. Supports multiple riding styles, including prone, drop-knee, & stand-up. Our Wave Skater® Pro Rat-Fish, Rabbit-Fish, Ghost Shark and Barracuda proprietary foam molded bodyboards are fabricated using custom made, CNC steel molds – one at a time – to insure the utmost in quality control. Our legendary one piece construction is incredibly durable, semi-rigid, and will take an extraordinary amount of pounding without ever delaminating or breaking apart, period. Our bodyboarding company started back in early 2006, from an idea for a better, high performance, high-quality, super-rider-friendly bodyboard that people both young and old could enjoy, whether they were experienced bodyboarders or not. 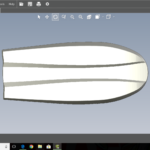 And after much trial and error a novel hull design was created, which added tremendous stability, increased safety, greater speed and enhanced maneuverability to the sport of bodyboarding. Now, more than a decade later, we are finally introducing our newest crossover surfboard/bodyboard, the 54”, ultra-durable EVA/PE foam “Barracuda.” It is essentially, a finless surfboard that can be ridden both prone, drop-knee and standing up. With its patented pontoon hull, super-rider-friendly ergonomic deck and streamlined shape, it cuts through the water just like a Barracuda; blazingly fast and highly maneuverable. We will never stop innovating and we will never stop improving our bodyboards. We can’t and won’t because we love this sport way too much! Please explore our entire web site and we hope you’ll all come along for the ride. And what a ride it will be! Wave Skater® Pro bodyboard -The only bodyboard ever selected to be featured at the New Jersey Surf museum. Quite an honor for us! 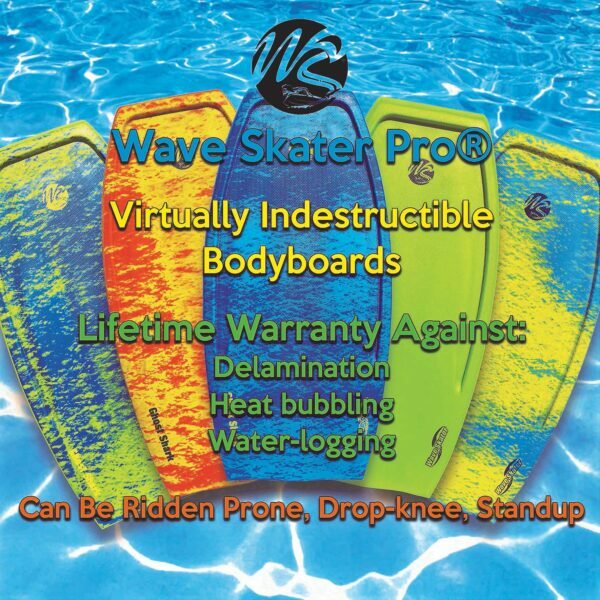 Wave Skater® Pro — Bodyboarding fully evolved!